Downturns in the stock market and real estate in the last few years have made us afraid to invest in anything but an insured savings account or cash in a coffee can.But today’s environment has driven bank savings accounts to such low interest rates, they’re not much better than cash. 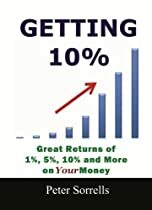 Is it possible to get high interest rates in today’s environment, when banks are paying 0.1% on savings accounts?Is it possible to find 1% withouthigh minimums and penalties for withdrawal?What about 5% return?10%?Yes!Even more than 10%.This Kindle book is dedicated to everyone that has ever lived with near-zero savings rates from the bank, while paying high service charges and high interest rates on loans and lines of credit… often to the same bank. And to anyone who’s ready to start growing their nest egg at a much faster rate.In this book you’ll learn where to look for those high rates, and some new ways of managing your money. Includes links to many resources. Over 6750 words. A companion to the larger book 100 Ways to Save and Grow Your Money: Financial Fitness for Regular People (paperback and Kindle).